So we gathered up the ingredients, and the supplies. We’re ready to start, but wait a minute… little one has a request: he wants to do everything by himself! 🙂 I was happy to oblige since it shows an interest in being independent, and getting hands on with the baking. I just cracked the egg. He mixed, poured and even looked with amazement how the dry mixture turned all gooey. He also got a kick out of looking into the oven window to see how the gingerbread man was baking. I love cooking or in this case baking with little one. It’s another one of our bonding moments, and it’s a learning process for him. He’s mastering his mathematical skills and learning the science of cooking. He’s learning time management and patience. By setting up the timer, and waiting patiently for the gingerbread man to bake in the oven. 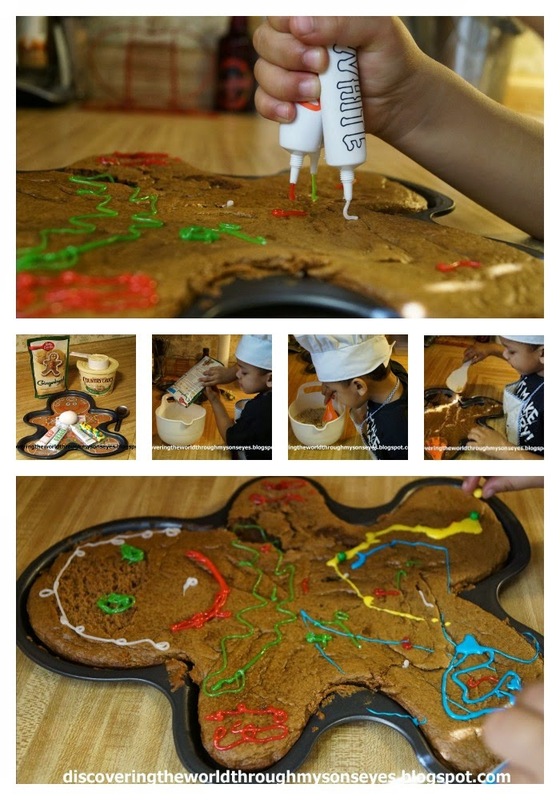 He’s also using his imagination and artistic creativity by decorating the gingerbread man. He was really “into” the whole I’m a “chef” now. He had his apron, and chef’s hat and was very much into character. After the gingerbread man was out of the oven, I asked him if he wanted to sit and decorate the gingerbread man. I was blown away by his answer, “Mommy chefs don’t sit. They stay standing up.” Humm, where did my child come up with an answer like that? Maybe looking at Mommy cook in the kitchen, or perhaps from the cooking shows that I’ve watched? I have no clue, but I was very proud of him for wanting to do the whole process all by himself. From now on, he’s going to be my designated sous chef when I’m in the kitchen cooking. 🙂 What yummy things have you cooked or baked with your child? Would love to hear from you. Please comment, like or share. Note: The gingerbread man is still in the baking pan because although we followed the instructions to a tee (ungreased mold) it didn’t come out! So I let little one do his thing with decorating it, and then I cut it out into large pieces. He was happy regardless! What a great little chef! He really is gaining a lot of skills, plus self-confidence at what he can do, Good for you for letting him really do it on his own! So fun!! 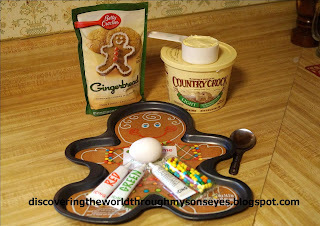 We love gingerbread in my house too!! Thanks for sharing it at the cookie swap! !